In order to gain the most benefits from this process, it is important to spend a minimum of 60 minutes uninterrupted skin-to-skin at any one time. You can do this as much as you like and it is particularly helpful in the first 12 weeks of your baby’s life. Although you should be resting as much as possible in your postpartum period, you can use a soft baby sling / carrier if you wish to keep your baby skin-to-skin while you are moving around your home. When a baby is placed naked chest-to-chest with mum, the sensitive nerves in the chest area are stimulated, which in turn produces oxytocin in both parent and child. This incredible hormone, which we talk a lot about in labour and birth, creates feelings of love and connection between the two. The production of oxytocin goes on to induce a wave of other hormones, which results in numerous other physiological benefits. It is not only for Mum to do. 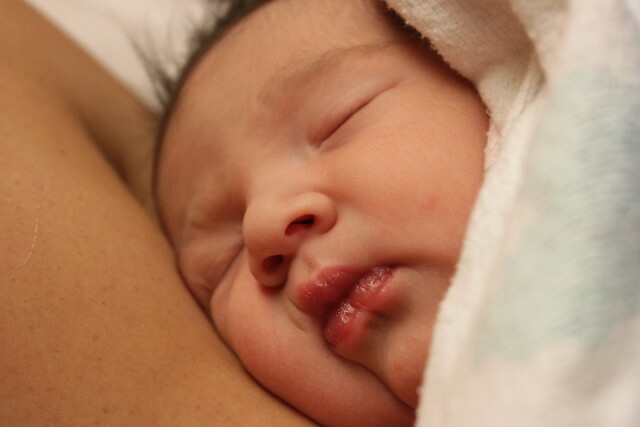 Dad, older siblings and grandparents can all enjoy skin-to-skin bonding time with the baby. And if for any reason, the mother is not able to hold baby skin-to-skin after birth, it is important for the father to do so. A baby’s birth is a pivotal moment in the development of his immune system. During a vaginal birth, the baby takes in healthy bacteria from the mother’s birth canal, which begin to colonise his gut with natural helpful microbes. Similarly, whatever the baby’s skin first makes contact with will have an impact on the baby’s skin microbiome (the body’s world of micro-organisms). 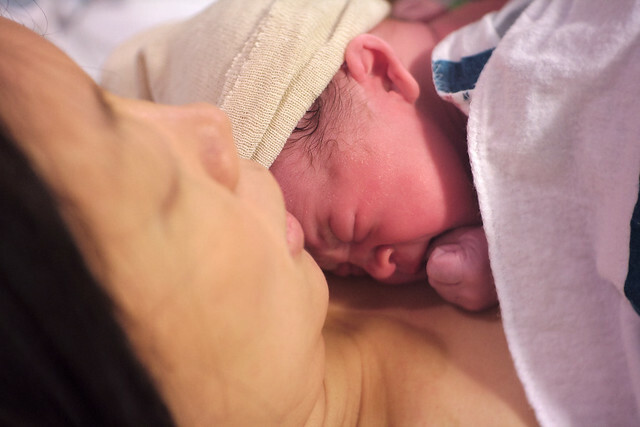 So, by having continuous skin-to-skin contact immediately after birth, you are ensuring that your baby’s skin has a healthy dose of your own valuable microbes and not just what is present in the environment you give birth in. Kangaroo care stimulates a baby’s newborn feeding reflexes, encouraging the baby to nuzzle, suckle and eventually latch on to the breast as well as to become familiar with your smell. It also promotes oxytocin and prolactin in the mother, both key hormones in the production of breastmilk and the milk-ejection (let-down) reflex. You can read a clear step-by-step account of how a baby begins to breastfeed when given an hour of uninterrupted skin-to-skin time after birth, on the Unicef website. For more suggestions for how to get off to a successful start with breastfeeding, you can read my previous post. Being skin-to-skin with mum or dad in the early days and weeks of life has a very calming effect on your baby. She is more likely to enter into periods of deep sleep when being held in this way, which in turn helps her brain development. Many women suffer from the different symptoms of postnatal depression, such as feeling low, tearful, finding it hard to cope or bond with the baby, lacking in energy and motivation. Research shows that spending regular time skin-to-skin with your baby as well as breastfeeding gives your body releases of oxytocin and prolactin, which help you to feel calm, loving, more contented and more caring towards your newborn. 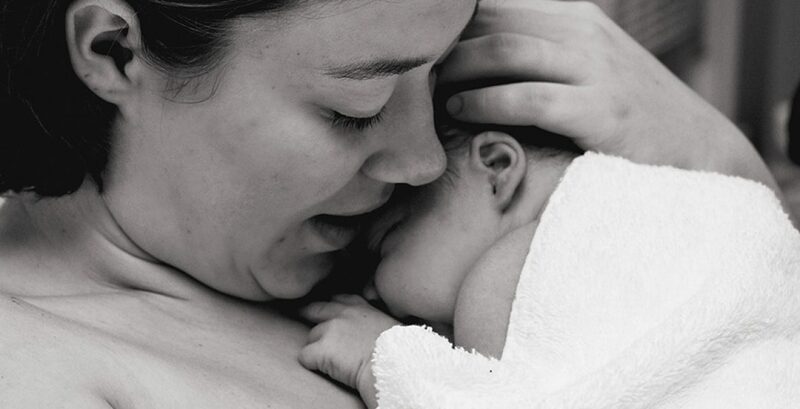 Skin-to-skin is also said to speed up a mother’s postnatal recovery by lowering stress levels and blood pressure and increasing tolerance to pain or discomfort. When a baby is calm and relaxed, his digestive system can work more effectively. Also, because baby is being kept warm next to your body, he doesn’t have to burn extra fat to keep his temperature stable, enabling him to gain weight more steadily. 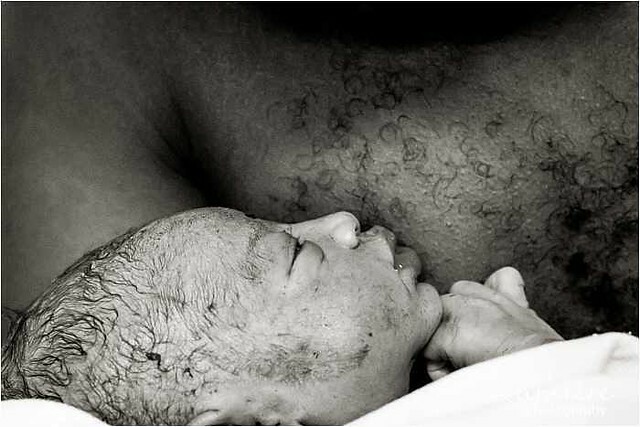 Because of the soothing effect of skin–to-skin, baby and mother produce less cortisol (the stress hormone). As the baby feels calm and safe next to a loving family member, she has less need to cry. Newborn babies have trouble regulating their own body temperature and their breathing can often be irregular in the first weeks. When your baby is skin-to-skin however, your body will naturally adapt to either warm up or cool down the baby according to what he needs. The close contact with your heartbeat and the rhythm of your breathing will help your baby to regulate his own breathing too. As you can see, there are many great benefits to spending time skin-to-skin with your newborn baby. It is not just a fashionable trend for hippy mums. Any mother, no matter how she has given birth or chooses to feed her baby, can experience the positive effects of kangaroo care. Previous postWhat is a doula anyway?